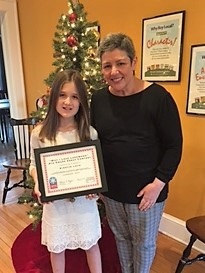 The Lakewood Chamber of Commerce is pleased to announce that Kirsten Loyd, a 4th grade student at Emerson Elementary School, is the 2017 “Why I Love Lakewood” Essay Contest winner. Essay contest winner Kirsten Loyd poses with Patty Ryan of the Lakewood Chamber of Commerce. Over 200 essays were submitted by 4th graders from Lakewood City Schools, Lakewood Catholic Academy, and children who are home-schooled in the community. A panel of six judges used a rubric to assess the originality, organization, descriptive language, and grammar (including punctuation and spelling) of the essays, and the judges selected Kirsten’s as best overall. Kirsten loves Lakewood because of the amazing places to visit, the traditions, the parks and the people. Kirsten will be awarded a cash prize of $100 and will ride in the Light Up Lakewood parade before she takes the stage with Lakewood Mayor Mike Summers and Santa Claus to “flip the switch” on December 2nd to turn on the lights in Downtown Lakewood during the Light Up Lakewood festivities. Do you have a favorite city? I do! I love Lakewood because of the amazing places, traditions, parks and people. Lakewood has so many fun places to visit. I enjoy going to the library and getting a good book. I also love going to the pool on a hot day. The restaurants in Lakewood are outstanding! You can always find something delicious to eat. I also love the traditions in Lakewood. There is always something to look forward to. Some of my favorites are the Spooky Pooch Parade, Light Up Lakewood, the Art Festival, Fourth of July Parade and the fireworks. Another reason I love Lakewood is all the parks. I enjoy going to Lakewood Park and playing on the new jungle gym, watching the sunset on the Solstice Steps, and even running in the fields. If you can’t go to Lakewood Park there is always a park near you. My final reason is all the wonderful people who live here. Lakewood is small, but it has a big heart. Everywhere you go there are people you know and it is easy to make friends and have fun. I hope you see why I love Lakewood and I hope you love it too.